Mix pork and cornstarch. Spray nonstick wok or 12-inch skillet with cooking spray; heat over medium-high heat. Add pork, mango, water chestnuts, mushrooms, gingerroot and garlic; stir-fry 1 minute. Remove pork mixture from wok. Spray wok or skillet with cooking spray; heat over medium-high heat. Add rice; stir-fry 1 minute. Stir in soy sauce. Add pork mixture, peas, onions and pepper; stir-fry 1 minute. Mango slices are available in jars in many super-markets. 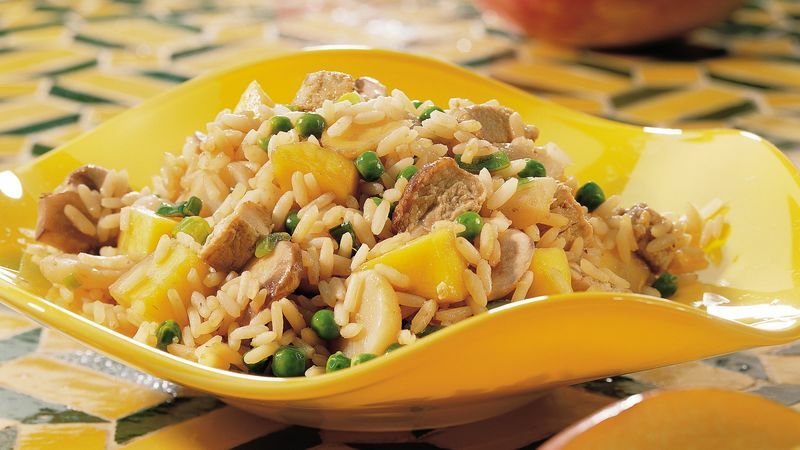 Substitute about 1 cup diced jarred mango for the fresh mango. For 1 gram of fat and just 215 calories per serving, you can substitute 3/4 cup diced firm reduced-fat tofu for the pork. Omit cornstarch. Tofu is rich in calcium, protein and health-promoting isoflavones, substances that may be good for your bones, your heart and your ability to prevent cancer.